The kitchen sink gets a lot of use in the average household. It handles its fair share of chores, from washing hands and rinsing dishes to filling pots and disposing of scraps. Although quality kitchen sinks can last a few decades, they do wear out eventually. Yet choosing a new kitchen sink shouldn’t simply be a matter of replacing the old one with the same model. Rather, it should be an opportunity to explore what a sink can do to make your life more convenient. That’s why DreamMaker Bath & Kitchen of Northeast Suburban Chicagoland, your premier local home remodel company, encourages our clients to choose a new sink based on how they’ll use it. 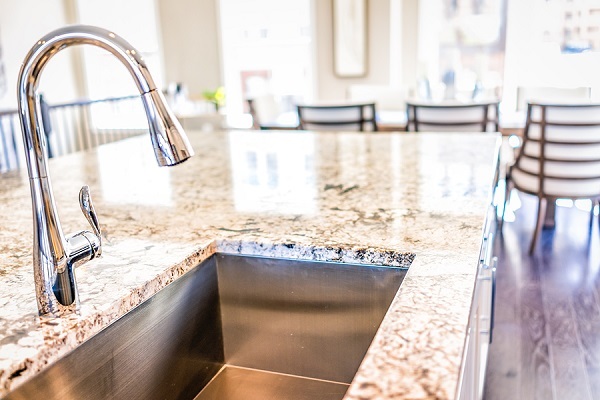 Here are some important considerations when choosing a new kitchen sink. Depending on a number of factors, you may want a sink with a single basin, or you may want one with multiple basins. A single basin lets you soak big pans and prep large amounts of food. Two basins of the same size or differing sizes let you perform different tasks easily, such as using one basin for soaking and the other for prep. Three-basin sinks typically have two large basins and a smaller one with a disposal. Sinks can be installed from above, with the rim of the sink resting on the countertop, or they can be mounted from below, which means that the countertop extends all the way to the sink. Which you choose depends largely on your design preferences, since both options have benefits and downsides. For example, drop-in sinks are generally less expensive and easier to clean, while undermount sinks allow for more counter space and accommodate the use of handy accessories. The four most common materials for kitchen sinks are stainless steel, porcelain, granite composite and natural stone. Stainless steel is very durable and easy to clean, but it can scratch, and water spots can be problematic. Porcelain sinks are available in white and any other imaginable color. They bring an authentic look to vintage kitchens, but they can chip and scuff. Granite composite sinks are scratch- and stain-resistant, but they require special maintenance and lighter colors can stain. Natural stone sinks can be made to match your countertop material, but they’re expensive and can scratch and chip. Sinks are available with a variety of extras to make your life easier. A sink with a built-in drain board can be convenient for draining dishes and produce. A sink with a lower middle divider makes it easier to soak long-handled pans. One benefit of undermount sinks is the variety of accessories that fit on the lip of the basin, such as cutting boards, colanders and racks. Kitchen sinks are relatively inexpensive, making them an ideal option for kitchen remodeling on a budget. But choosing among the many types of sinks can be tough, since each type will have its benefits and drawbacks. A DreamMaker designer can help you evaluate your sink use and design aesthetic, so you can choose the perfect sink for your new kitchen. Call DreamMaker Bath & Kitchen of Northeast Suburban Chicagoland at (847) 327-0203 or submit our online form to start a conversation!